I’ve been working through so many fantastic home projects the last few months. Organizing spaces. Tidying and sorting and putting things in places. It’s been good in so many ways, but mostly because it helps me sift out the useful and beautiful from the superfluous. I find renewed peace and beauty in these “sifted spaces” and naturally there is the practical joy of living out my vocation in simplicity. Clutter and chaos do not yield peace. Ever. I know there is a significant appreciation for the “does it spark joy?” philosophy (Konmari), and I can appreciate that as a beginning. But my spaces are so organic. They flex and bend in service to the persons here who move through seasons of life. I’ve not found one static space yet – there is always growth and change, so there is always a need for periodic sifting. How will this space/tool work most intuitively for me/us? Practical tools should be workable and where I need them. Material goods that are no longer serving the family can move along. When organizing a space, I want to work “with the grain” as much as possible. How can this space or tool reflect beauty? 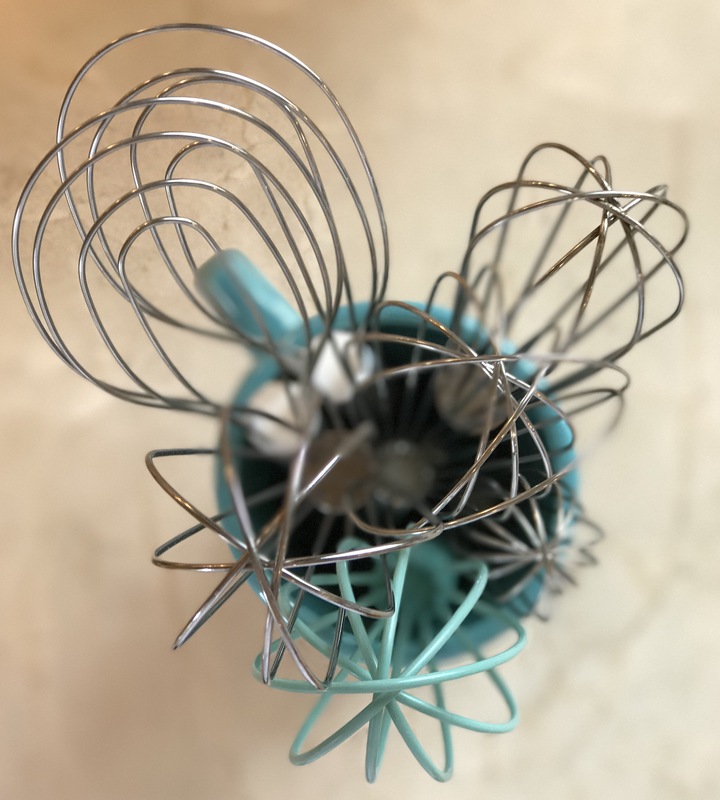 Because I think everything can be beautiful – from a collection of whisks on my counter to the art I choose to reflect the liturgical year. Clutter (of any kind) impedes the ability of a thing to reflect beauty. As I’ve been organizing my kitchen and laundry room and closets, I’ve also been thinking a lot about blogging. And social media. And following the same considerations as I seek to share the beauty I find in the ordinary, practical parts of my day. I’m sifting these digital spaces, too. I enjoy sharing through social media – my Facebook page and my Instagram account (both of which you’ll find linked in my right sidebar). It really is joyful to connect with each of you as we pass each other briefly in these digital rooms, on our way to some other meaningful work. These encounters are encouraging and inspiring amidst a digital cacophony that can be unsettling and at times hideous. I like the ease of sharing on Facebook and Instagram, and I wondered if I could share more easily through my blog as well? So this post is a little bit of an experiment. I’m posting from the WordPress app directly from my phone. And the photos are all taken with my iPhone – just everyday phone camera shots. All very ordinary. And I’m wondering if this “with the grain” ease in posting will still allow me to share the beauty I find in my ordinary here…on this blog…with you? I wonder, with all the voices out here in blogville and social media, if mine adds anything unique or worthy? Am I salt and light? Or should I sift a little more? All thoughts worth pondering as I continue organizing one room at a time around here! I’m in the office/schoolroom this week – files and pens and books and shelves…here I come! If you could eavesdrop on the conversations of homeschooling mothers, you would realize how much people appreciate all that you share here at Wildflowers and Marbles. Your thoughtful posts inspire so many of us. God bless you! Oh goodness, Christine, those are very kind and encouraging words – thank you!! I only found you a couple of years ago I the blog world but my keyboard travels to your world weekly. I love your Instagram pictures and your blog has been very useful to me as a homeschooling mom and a homemaker. You have a gift for finding beauty and simplicity and I am grateful you share it with us. That’s very encouraging to hear, Melissa. Thank you!! I’m always amazed what the Holy Ghost can do here – because I never set out to share with a “brand” in mind. I mean, everyone in bloggy-world today talks about their niche and mine is varied, but I suppose if there is a cohesive principle it is that “beauty in the ordinary” idea that God underwrote in all these posts. And over the years, He “sifted” me and it became clear that my joy in sharing the simple and ordinary through the lens of my eye, and the beauty that I saw, was indeed what this space is for. I’m grateful for your observation, Melissa! And so glad to have you here! Wow. You have a way with words. I enjoyed this post. But I am curious, what’s in the basket? Good luck to the rest of your organizing. Thanks, Crystal!! The basket in the first picture is the top of my Raskog cart! I just finished organizing it when I took this picture. 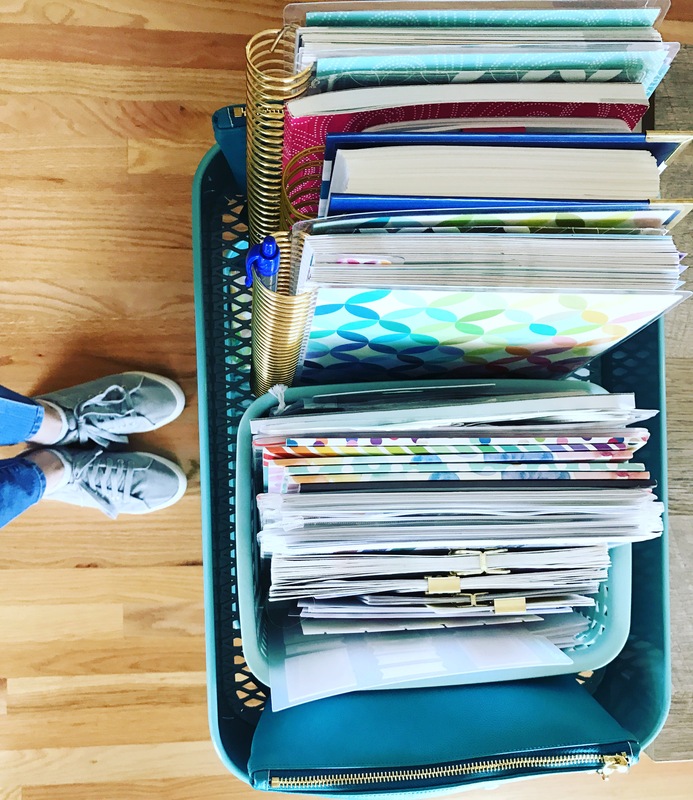 It’s my mobile project and planning station and the top basket which is pictured contains the various planners and planning tools I use for my life planner, homeschool, wedding planning. I’ll share more of it soon – I’ll post pictures of the schoolroom and my little office area when I’m done organizing in here! I personally prefer blog posts to Facebook posts. Those tend to get missed or lost, I still find it easier going via a blog or getting emails. I agree. Facebook has a value in offering snippets, but blog posts are easier to search and archive. That’s a valuable recognition – thanks, Claire! I really prefer blogs to all other forms of posting, although I understand they take more time. I miss those who I used to learn so much from that have stopped blogging. I have loved what I have gleaned here about home schooling and raising children and books and really miss those posts. So yes! You are very much salt and light!! Thanks so much, Sharron! This is so helpful to consider! Yes, please keep blogging and sharing with us. You have inspired me in my home school more than anyone else. Also, your lovely photos are like a “happy place” that just lift the soul. You have a wonderful talent in what you do and it is so helpful to others. My youngest is almost done with home school so now I am refocusing on little ones again hoping to help out all the new homeschooling moms at my parish. Also my oldest daughter is newly married and would like me to help her in her homeschooling journey with her future children…so I hope you keep posting about your home school journey with your youngest daughter. I just love your way of doing things! Thank you so much! I’m so grateful for your perspective and kind words! They are humbling…and encouraging! THANK YOU! I have a grown daughter, too, and she’ll be married in 2 months! I can hardly believe it – the little girl that popped up in the posts here 10 years ago is now almost married! Time!! Time goes by so quickly! It will be an adventure entering this new season of life. We have learned so much over the years. It is important to share it with the new young mothers coming up. They will have many challenges because of the world we live in now. They will need our help and encouragement. Keep blogging! I too prefer reading blogs; facebook takes a while to sort through. Your blog is inspiring for us homeschooling mamas! And a future post idea…I would love a post on beauty in the home when the budget is tight. Thank you so much for your kind words, Cecelia! And that’s a great post idea!!! I’d love to post some ideas and pictures on that topic! Your blog is so beautiful, and I personally love it when you have something new to put on it. It really is inspiring to me as a homeschool mom and planner addict! Thank you for what you do. I LOVE your blog. It is my absolute favorite. It is beautiful and I have learned so much from your posts about home schooling and home organization. ! I am constantly inspired by it. Thank you so much for what you do here and please keep blogging! Sumer – Thank you so much for all your kind words!! They’re so encouraging! Oh please keep blogging if you can! I don’t have Instagram or Facebook and your blog has been SO inspiring and encouraging to me. It is a breath of fresh sweet air on the web and that is SO needed! Whatever you decide though, THANK YOU, for writing and sharing what you have! Thank you so much, Lisa! I plan to continue blogging – I’m just not sure how it will look yet! I’ll still be here though! Over the years I have tried to cut down on social media but your blog has been one I always turn to for inspiration. That means A LOT, Amy!! The depth of what you have shared in this space is reflected in the wonderful post headings: rebuilding culture, considered lists, a calling within our call, etc. Topics almost unheard of anywhere else. Authentic Catholic inspiration that apply across the womanly traditions of taking care. This has been reflected in depth by you in this space. Oh Happy Day … Calooh, Callay! Building relationships with these ideas cannot be easily done in the flashcard style of FB and Instagram. A ‘living book’ or blog is needed. It is needed by me. You may be the ONLY Catholic wife, mother, educator and philosophizer some of us see all week. You bring something not just unique but needed to my everyday and I thank God for that. I’m truly grateful for your kind and encouraging words and observations, Sherrylynne! It’s true – over the years I’ve poured heart and words into this blog. I honestly don’t want to stop blogging – it’s something I deeply and earnestly love! However, it is something that has to be a side focus for me. I actually (in my heart of hearts) long to give it more of my time. But, vocation first since that’s my path to holiness. Anyway, I think your comment has given some direction to a few of my thoughts. It’s all distilling. Sifting. 🙂 So, thank you!! I enjoy the blog posts! Although I follow you on IG, I enjoy the more in-depth writing at the blog. I almost always glean something from your posts. Today’s reading: Sifting! Yes! I need to sift several areas in my life! Thank you so much for taking the time to share that, Denise! This has all been very encouraging and helpful to me! 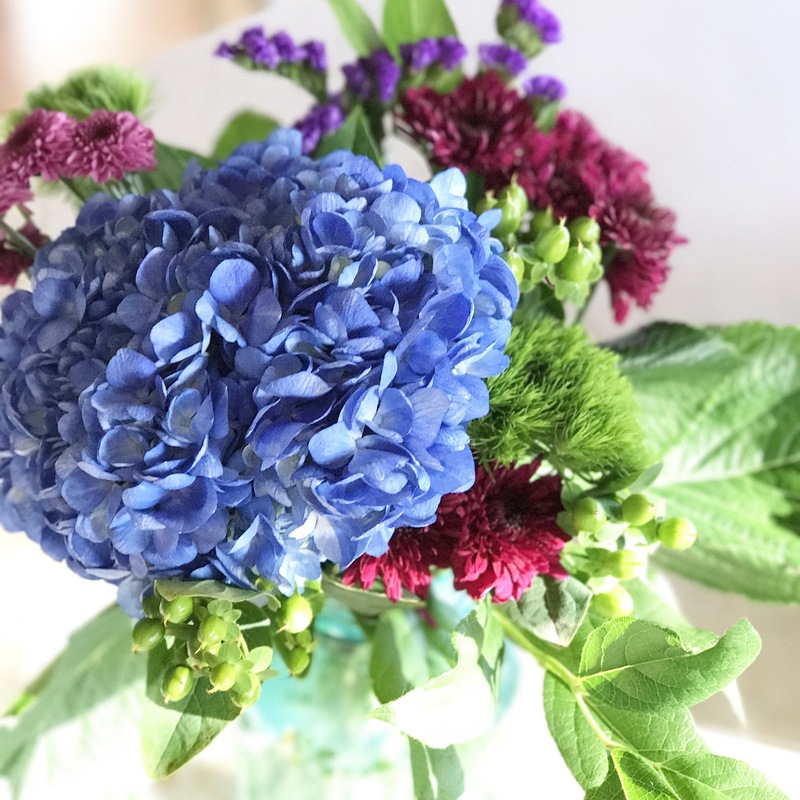 It is calming to read your blog. I follow you (and others) on Facebook. Even if the content is the same, the experience isnt. Facebook is chaotic, cluttered, and addictive in a way that drives me batty. I never leave Facebook refreshed. But here, I can relax in peace and encouragement. I know what you mean about Facebook, Annie! I find it visually cluttered…and noisy, too. Thank you so much for your kind words. That is exactly the atmosphere I hope this little digital corner is: encouraging and peaceful! Thank you for the time you have devoted to your blog. I hope you continue to find the time to share when you can. I look forward to the posts in the same way I used to look forward to a good magazine coming in the mail. I replay several quotes from your postings and they bring me much comfort as I walk through a “season of suffering”. Bless you. Thank you, Theresa, and sending prayers! You’re never closer to Him than when you stand at the foot of the cross. May His grace sustain you! Jen, I’m so tickled to scroll through the loving comments by so many who have been encouraged by your work. It’s the Truth, Beauty and Goodness we are all drawn to and appreciate in your writings. Keep sharing as you can. I’ve followed your blog from my very first homeschool days – my oldest is the same age as your oldest and we are also wedding planning right along with you! I have so much enjoyed your increased presence on social media – I truly appreciate your wording of “we pass each other briefly in these digital rooms” – what a refreshing perspective. You even make perusing social media a thing of beauty! Please continue – either through your phone or not – you have a gift of inspiring others! When I first read your post (so happy you posted) I thought, “Oh, I am just an old fogy who refuses to keep up with the social media times. I won’t bother to mention that I love her blog and dislike having to go to other sources like facebook etc.” Well, surprise! I guess I am not the only one. You really do lift my spirits. Thanks Jen! You are my mini-retreat resource and have provided so much inspiration and guidance over the years for living the faith, family, and homeschooling (6 kiddos 3-16). I can never find time for Facebook and I have no other social media sources. I still have a flip phone 🙂 and every time I think I really should enter more into the modern world, I hesitate because I know it will only serve to distract me from my vocation. I will admit that in the first few years I would let the enemy say things like “why can’t you have it more together like Jenn,” But over time the beauty of your words and support nourished my soul and gave me great courage. The Lord has really given you a great gift and I am so thankful you have generously responded and shared with all of us. When I need inspiration and calm, all I need to do is come here. Barb, your kind words are so encouraging! I’m grateful!!! I have followed you for years and find your blog uplifting and inspiring. Certainly, I understand the need to sift and support your choices. I hope your archives could remain! Thank you for sharing beauty in the ordinary with so many. Thank you so much, Daniele! The archives will remain and I’m not going anywhere either! See you ’round!! Please keep it up, no matter which way it comes! Even though I don’t home-school (though am ALWAYS thinking about it!) I find your lovely blog such a tremendous resource and comforting balm in so many ways.